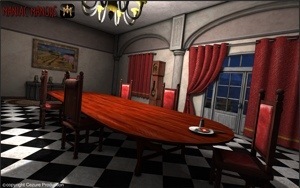 Maniac Manors is a unique 3D adventure game for Android and iOS devices by French company Cezure Production. The action takes place in a small 60’s American town. The player takes on the role of a real estate manager who thinks he got the deal of the century by buying an old manor for a ridiculously small amount of money at an auction. He gradually understands that the deal could cost him much more than money as he uncovers the secrets behind the old building. 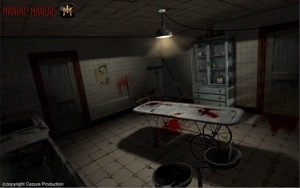 Two virtual joysticks allow the player to explore the environment and interact with it by collecting objects, combining them, and solving puzzles. The game is planned for release in August 2013 in English, French and Spanish. I don’t know about you, but I can’t wait to play! The game is now out! You can download it here. 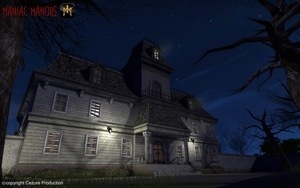 And here is the Maniac Manors Walkthrough. Oh it looks so good I may have to break my rule of not playing first person games. I so hope this one doesn’t give me vertigo. Thanks for showing me. I added a page for a walkthrough but haven’t yet started it. Sorry! Will get on it ASAP. – use that screwdriver on the paint pot near the wooden house so you get the key of the door next to it. -use that hammer on the pot near the entrance of the manor so you get the key to enter in it. THANKS!!!!! U helped a lot. Finally in the house. It is hard. So far I got one thing, not sure what to do now… Been up stairs and down. I thought the chest in hall could be opened,but, its not doing anything…. I started working on the walkthrough. But due to the nature of the game, this will not be a quick one! Since the last update, I found the english so much better!